Im gonna be taking a break from Yu-Gi-Oh for a bit. Probably pick it up when battle packs come out, not sure. Im not gonna say the ban list, or the current meta or high priced the cards have become as a reason why this is. But I can honestly say after playing some Vanguard it has a lot of the fun element and challenge that I was finding lacking from Yu-Gi-Oh. 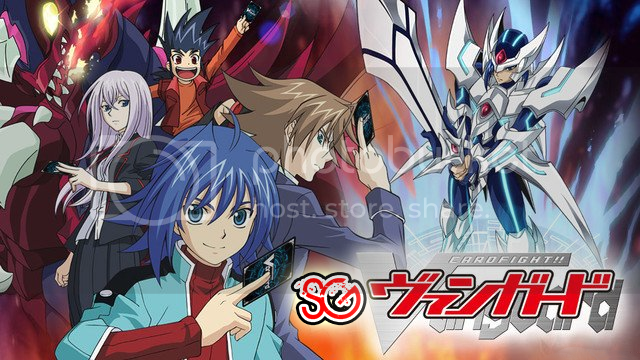 So Im gonna run some posts about the game, dynamics, decks, combos FAQs etc etc to help promote the game because in all honestly its appealing to not just disenchanted yu-gi-oh players but magic players that Ive been teaching it to have been loving it as well. A COUPLE NEGATIVE RESPONSES FROM PEOPLE IVE BEEN TEACHING THE GAME TO. "The games are so fast and there doesn't seem to be a lot of strategy." -Most of the game play you have seen up until a day or so ago is mostly based on the 2 trial decks (Royal Paladin and Kagero) Many have not invested in booster buying or looked at the next set which is now out and future sets. When you progress beyond the trial packs the game really opens up. You will start to see tons of combos and effects that you didn't see before, and as new clans get support the game will diversify. fast hitting games will yield to longer more strategy oriented ones. This is going to really be a non issue now that the second set is out.